This book, however, did not sweep me off my feet. I was worried. I had heard so many good things about the series as a whole, but judging by this book, I didn’t know if I could make it through and entire “House of Night” reading marathon (which I LOVE to do – immerse myself in a world that is eight books deep – that’s HEAVEN to me). It’s not that there was anything particularly wrong with the book. More like, it just felt too young for my tastes. The writing style irritated me. The main character’s thought process and introspection was often silly and annoying. My husband suggested to me that had I read it when I first started this blog (before I became so engaged in these much more “adult” urban fantasies), that perhaps I would have liked it more. I thought he might be right. Maybe I had simply moved on from YA to strictly adult? But that couldn’t be right considering my love for Vampire Academy. But (yup…there’s a but). I’ll tell you what I realized. I’m already halfway through book# 3, and I’m hooked (actually got hooked a quarter into book# 2). I don’t know if I’ve simply gotten used to the writing style, or if I’ve finally connected to the characters (I have), or if it’s that the writing has gotten that much better (it has) and the series has found it’s rhythm, but I LOVE this series so far. In fact, I’m dying to get back to it. It took me days to get through book#1, but I’ve easily plowed through books 2 & 3 almost without stopping. They’re that engaging. So here’s what “Marked” is about. Zoey is a regular gorgeous teenager dating the high school hottie. From what I gather in this book, he’s a goof. Stereotypical jock that ends up wanting to party and make out (with everyone), so the two never really connect. In this world, vampyres co-exist peacefully with humans (although there are some that hate vampyres – Zoey’s über-religious step-father being one of them). One morning, Zoey arrives at school, discovers a vampyre at her locker, and he “marks” her. He lifted one long, white finger and pointed at me. As my forehead exploded in pain, Kayla opened her mouth and screamed. A tattoo-like symbol shows up on her forehead. Genetically, some teenagers begin a change process that “turns” them. So far, nobody knows why, or how, but once the process begins, it cannot be stopped, and the fledgling vampyres must stay near their own to complete the change. Zoey’s been “changing”, and the vampyre that showed up at her locker just confirmed it. She’ll either become a vampyre, or her body will reject the change in the four years it takes, and she’ll die. Her life as she knows it, has ended. She must move from her home, and onto the vampyre campus (The House of Night), and school will begin anew, however it will be amongst vampyre students and teachers. I walked into the family room to find him standing by the couch. My mother was crumpled near the end of it, clutching his hand. Her eyes were already red and watery. Great. She was going to play Hurt Hysterical Mother. It’s an act she does well. John had begun to attempt to skewer me with his eyes, but my mark distracted him. His face twisted in disgust. “Get thee behind me, Satan!” he quoted in what I like to think of as his sermon voice. Her friends are appalled (well, ‘cept for her almost boyfriend Heath, he finds it kinda hot). The only one who supports her and loves her unconditionally, is her Cherokee grandmother, and with that support, (and the support of the Vampyre Goddess, Nyx who appears to her in a dream), Zoey finds the strength to face a new world. She has a purpose, and she is determined to own it. The Goddess stood up and walked gracefully toward me, her voice painting silver symbols of power in the air around us. When she reached me she wiped the tears from my cheeks before taking my face in her hands. Zoey Redbird, Daughter of Night, I name you my eyes and ears in the world today, a world where good and evil are struggling to find balance. She smiled serenely. You are old beyond your years, Zoeybird. Believe in yourself and you will find a way. But remember, darkness does not always equate evil, just as light does not always bring good. This book runs us through the typical teenage gamut. Just because they’re vampyre fledglings, it doesn’t mean the school doesn’t have the typical cliques, hotties, and mean girls (aka “Hags from Hell”). And when the most popular High Priestess teacher (Neferet) takes a personal interest in Zoey and decides to mentor her, the main mean-girl wigs out!! Oh and of course, the highschool hottie/absolute sweetie, Erik Night, also takes an interest in Zoey, which just makes matters worse. Watch out Zoey, she’s coming for you! So I’ll leave it at that. The book does actually get much better towards the end, and once you start book#2, you won’t wanna stop. That review will be next. 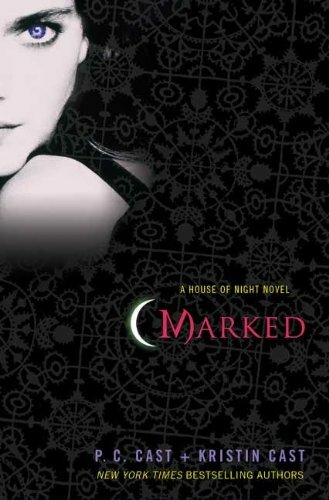 I’m giving away my copy of “Marked” – Let’s do the same thing as the last time? Leave a comment (no mailing address needed yet – I will get it from the winner via email), and by Monday January 31st 2011 at 9pm EST, I will get one of those randomizer thingies to choose the winner. U.S. residents only please (although all are free to comment, I’d love to hear your thoughts on this series, or other YA series). I love this series. I have read the series of few times. Marked was the slowest one of the books. They start to pick up after you get thru Marked. I love them all. Each time I finish one I have to hurry up and pick up the next one. They are addicting. One of favorite favorite YA series is the Vampire Academy. Same thing, I had face booked you earlier in the month saying I was struggling to get through Marked, however, about a little more than half through, I finally started to get into it. So much so, that I will pick up the next one and see what happens. I was glad that this series that has been so talked about did not lead to bitter disappointment on my end and that I will give it a shot. I am buying these books for my 12 yr old niece who is now ready for Hunted, she kept telling me how good they were. Yup…book 1, while nice enough because it introduces us to the rest of the series, was to easy to put it down. I’m so glad I had past readers who encouraged me to continue, cause now – this is CANDY!!! Yummy! So Lisa!? Are you still reading the series. I’m on book#5 (almost done). I’d say the series just gets more and more interesting, and exciting, and emotionally exhausting. My “mood” for this book, I’d say is annoyed with a certain somebody 😉 LOL! Can’t wait to see how you end up feeling about it. As an author, it came highly recommended to me by a dear friend when I began writing Shark Bait and the rest of the novels in the Grab Your Pole series and was trying to figure out what I could get away with and still have the series considered YA. While my stories are not paranormal, my friend felt it would be an accurate gauge. I, too, didn’t connect with the characters until somewhere in the second book, and I’m not entirely certain why, but, there it is. In fact, I skipped the first few chapters and being told repeatedly to “just keep going,” I still heavily procrastinated in finishing Marked. Once I did, though, I devoured all four books (the series wasn’t as far in as it was when you started reading) and I found myself chomping at the bit for the fifth book, the sixth, and so on. Although now, I will admit, my voracious appetite for them has trailed off after reading Awakened. That might be due to being caught up in my own publishing frenzy and all the endless hours of work that entails, or it could be that I wasn’t thrilled with the direction it seemed the series was going, but I’m hoping to have some time this summer to catch up on the two newer releases, Destined and Hidden.